Over the past few years developments in technology and social media have caused major changes to how we engage with art, culture and each other. The role of the curator in facilitating creativity has also changed. Portable’s Curators Conference offered a platform to discuss just what it means to be a curator in the digital age. Intrigued by this premise, I went along curious to see just what the day would reveal about cutting-edge curatorial practice. 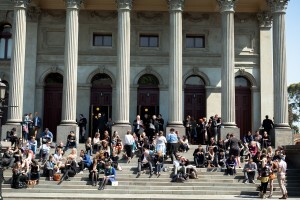 Hot on the heels of Portable’s inaugural Curators Conference, held in May this year in New York, the one-day event recently took place in Melbourne, another “cultural capital”. 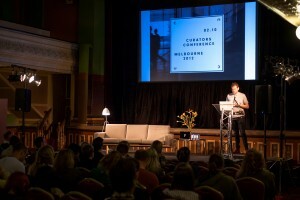 The conference was held at the Fitzroy Town Hall and featured nine leading “curators” from fields as varied as culture, digital life, film, music design, online publishing and business. It was fitting that Portable, an online curator of videos from a number of creative fields, was behind the event. As several of the speakers pointed out, the definition of the verb “to curate” has associations with care giving, particularly of material objects. Dictionary listings define it as ‘to care for; to organise; to pull together’. With a background in art galleries and museums, I, like many, often associated the title with those industries. However, like so many things, today the term has expanded to encompass much more. I was struck by this shift in definition during Simon Westcott’s presentation about his role as managing director of the Mr & Mrs Smith boutique and luxury hotel collection. It hadn’t occurred to me that managing a collection of hotels, which each meet strict criteria in order to remain in the sought-after Mr & Mrs Smith group, could be considered a curatorial undertaking. Yet, in the same way we “experience” an exhibition, we also experience a space – be it physical or virtual – and a great deal of time and effort goes into cultivating that experience. The same goes for the online world. The role of curating social media and digitally-based businesses was a hot topic of the day. This included phone apps, online magazines and career networks, which Jonathan Barouch (Roamz.com), Nick Shelton (Broadsheet) and Pip Jamieson (The Loop) respectively discussed. Listening to these speakers made it clear that contemporary curatorial practice is flourishing with the onset of technology and social media. 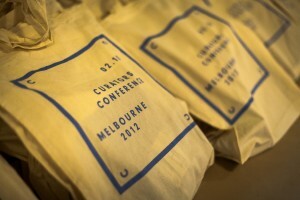 Appropriation was another idea explored by a number of presenters at the Curators Conference. Perhaps none as engagingly as Kirby Ferguson, whose presentation ‘Everything as a Remix’ drew on his skills as a filmmaker, editor and writer to highlight the fact that appropriation is not a new endeavour. Ferguson’s ‘Three Keys to Creativity’ – copy, transform and combine – encapsulates the path we all take when embarking on a new project; though are perhaps not always willing to admit it! Highlighting how stalwarts of culture, including Bob Dylan, George Lucas and Steve Jobs, espoused these three keys when creating their work, Kirby reminded the audience not to discredit the validity of online, digital and new media art, especially that which quotes previous ideas. For, as he claims, ‘everything is a remix’. It wouldn’t be a successful conference if the speakers didn’t give some words of wisdom to the audience. Offering a number of useful tips for emerging writing and creative individuals, Queensland non-fiction writer Benjamin Law’s presentation was one of the most accessible of the day. Promoting his recent publication Gaysia: Adventures in the Queer East, Law’s presentation was full of the witticisms he is known for. Describing his career path, Law spoke of how he shapes – or, if you will, “curates” – his ideas to suit the various publications and audiences he writes for. His presentation offered welcome practical advice to emerging curators, like myself. Curator of the MONA FOMA Festival and former Violent Femmes bassist Brian Ritchie gave a suitably uplifting closing presentation. For a conference that explored the relationship between technology, new media and curatorial endeavours, it was refreshing to watch Ritchie speak without support material – i.e. no PowerPoint. The whole room was absorbed as he spoke of the motivation behind his Festival, held annually since 2009 at Tasmania’s cutting-edge art gallery, MONA. I was struck by his intelligence, enthusiasm and, ultimately, his belief in the power of the arts to make the world a better place. This entry was posted in Art, Featured and tagged art, Culture, film, melbourne, technology. Bookmark the permalink.